Compelling, practical, and inspirational, Deliberate Success presents cutting edge principles and implementation tools that you can immediately apply in bringing out the best of yourself, your team, and your organization. Published by Career Press in several languages, the principles and tools in this leadership book transcend time. PURCHASE autographed hardcover copies for $24.99 plus S&H (quantity discounts available) through Allenbaugh Associates or by calling us at 503-635-3963. Deliberate Success will challenge and inspire your best while providing pragmatic tools that make a good Leader great. Deliberate Success will position you for winning in business and in life through principles and tools that transcend time. Success is a deliberate and principle-centered journey. This book will assist you in successfully moving from where you are to where you want to be. 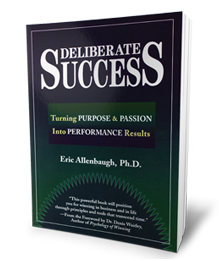 Deliberate Success will engage you in an important journey of taking control of your destiny, empowering your teams, and creating an even more fulfilling life.